There were and still there are territories in the continent of Europe that are in the foreground of international political, scientific, economic etc. public interest from time to time and then the interest in them fades for a shorter or longer while. The Balkans Peninsula, "The Balkans" and Southeast-Europe have already been in the centre of the European public attention and power games several times. By the right of the ancient Greek civilisation, the southern parts of the Balkans Peninsula can be taken as the cradle of the European culture. The history of the Roman and the Byzantine Empire started a peculiar process of "change of empire" in the region in the broader sense. The Republic of Venice as a super power "spread the enlightenment" in the Mediterranean areas of the Balkans Peninsula. The Ottoman Empire conquered the Balkans for centuries and accordingly had deep structural effects on the whole of the region. Modernisation was a complicated process, a multi-player "game" from the beginning, where the Ottoman Empire, the desire of the oppressed small peoples for liberty and later the conflicts among them all played their parts, as did, last but not least, the super powers who treated the small nations almost as "toy dolls" durrog their rivalries. The definitely not positive consequence of all these common activities became the birth of a "hornet's nest" in the Balkans. The 20th century reinforced in many respects the negative connotations of "The Balkans", among the peoples living in the peninsula few admitted their "Balkans" character or attached themselves to "The Balkans". 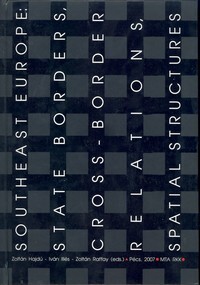 International politics and political geography, however, still created a special notion (balkanisation), generalising the processes of the region. Actually it was a dilemma from the beginning in the development of geographical science how to divide the volatile political units (states etc. ), changing frequently and within short times, which stand the test of time, enjoy a public consensus and are acceptable for everybody. (Later it became a Basic issue of regional science and the European macro-regional co-operabon and planning process.) In the beginning the hasis of the division was provided by the basins (catchment areas etc.) of the large rivers, but it turned out soon that the rivers were far to attractive for the "state border makers" of the actual powers, so no final solution acceptable for everybody could be reached by such a division. The volumes now published in Hungarian and English languages were not written as monographs and do not give a complete picture of the whole Balkans region (this will be done by the monograph to be published in Athens, providing a comprehensive summary of the whole research), or the role of Hungary in the research of the area. What the studies do is highlight some important segments of the special issues (important from the aspects of Hungary) of the Balkans. Hungarian academics have been actively studying the Balkans Peninsula und Southeast-Europe for about a century und a half. The internal transformation processes of the region - as thoroughly documented by Zoltán Hajdú - have always had a considerable impact on the directions of the Hungarian researches. The structural features of the countries of Southeast-Europe und the components in the transformation of the internal spatial structure are mised as issues of European significance in the essay of Iván Illés. The macro-regional processes und the development of the situation of the individual countries followed different development paths after the systemic change, too. The development of the macro-regional transport connections has traditionally been important for Hungary. The essay written by Ferenc Erdősi gives an introduction to the transport processes of the region, together with the political correlations of these processes. Gyula Horváth in his essay analyses the general determinations of the regional processes in East-Central Europe, drawing attention to the occasional differences as well. In this region, regionalism is a more complicated phenomenon than in the other parts of Europe. Ilona Pál-Kovács gives in her study an overall view of the internal administrative reform tendencies of the Southeast-European countries. The political weight of public administration is significant in each of these countries. The situation is especially interesting in the case of Bosnia und Herzegovina. New spatial categories have emerged (West Balkans), but the consolidation of the whole of the region and its placement in the European integration process is still to come. Zoltán Pámer deals in his study with the European Union integration processes (and often question marks) of the West Balkans. The processes of the historical and the recent past, and the still unsolved situation of Kosovo make it necessary confront the issue whether the European Union is going to be able to "Europeanise" the region. If not, the unsettled tensions and processes in the Balkans will partly destabilise the southeast parts of the European Union.